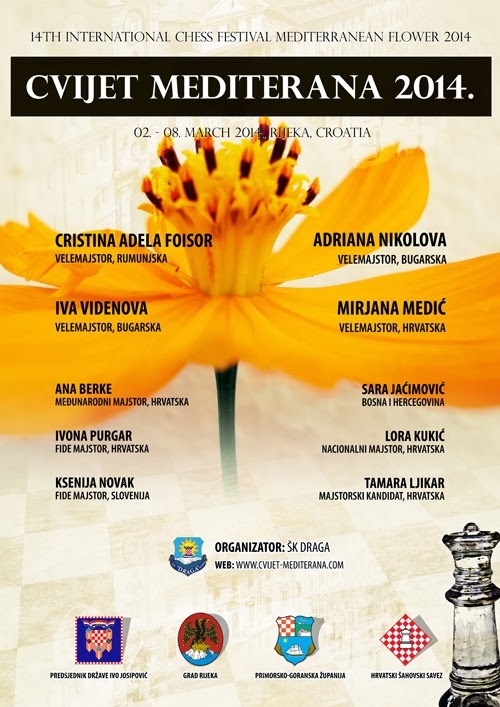 The Mediterranean Flower Chess Tournament - 14th edition - will feature a special closed event with women chess players: Cristina Adela Foisor (reigning Romania women's chess champion), Adriana Nikolova, Iva Videnova, Mirjana Medic, Anna Berke, Ivona Purgar, Ksenija Novak, Sara Jaćimović, Tamara Ljikar and Lora Kukić. The 10-players round robin event is organised by the Chess Club Draga. There will also be an open tournament along with the closed event for women chess players from March 2-8 at the Rijeka Chess Club, Croatia. Official website. Defending champion IM Eva Repkova will not be playing this year.